The Peterhead Seafood Festival has received a funding boost of over £30k from the NESFLAG programme. The North East Scotland Fisheries Local Action Group (NESFLAG) has awarded grants worth a total of £516,472 to eleven projects in Aberdeenshire and Angus. The group approved the applications in the latest rounds of the programme which supports economic activity and community development in fishing communities of the North East. The Peterhead Seafood Festival 2019 received a total of £32,173.50. In September last year a small-scale pilot festival was held in Chapel Street and Queen Street, consisting of stalls selling seafood, cooking demonstrations, heritage displays, and children’s entertainment. The festival was very successful and feedback was positive amongst stallholders, local businesses and members of the public. Following its success, Rediscover Peterhead now intend to roll out the festival on a larger scale and lay the foundations for a high-profile annual event. The event will return to the town this year on Saturday, September 14. 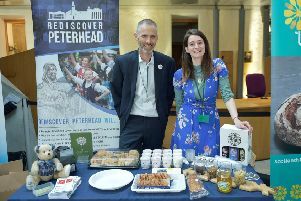 Iain Sutherland, BID Manager at Rediscover Peterhead, said: “We are delighted to have been awarded funding for the Peterhead Seafood Festival 2019, by the North East Scotland Fisheries Local Action Group (NESFLAG), the European Unions’ European Maritime and Fisheries Fund, and the Scottish Government. “The grant award will facilitate the delivery of an exciting new seafood event, attracting thousands of visitors to our town centre, located adjacent to Europe’s largest white fish port. NESFLAG manages the small scale “community-led local development” element of the European Maritime and Fisheries Fund (EMFF), financed by the European Union and the Scottish Government. The programme is co-ordinated by Aberdeenshire Council and comprises a partnership of around 20 organisations from the private, public and community sectors. The programme, which launched in March 2016, has a total budget of £1.43 million of which more than £1 million has now been awarded to 25 projects.